It can be difficult when planning your travel to know if your kids will actually enjoy a particular activity. Kids seem to always have very different opinions than their parents. Sometimes, you just need a kid-size review to give you some insight into a child’s way of thinking. To help you out, I’m posting a series of posts entitled “Boston Takes On.” These are reviews of locations, activities, and events in the words of my son (with some useful information thrown in by me). 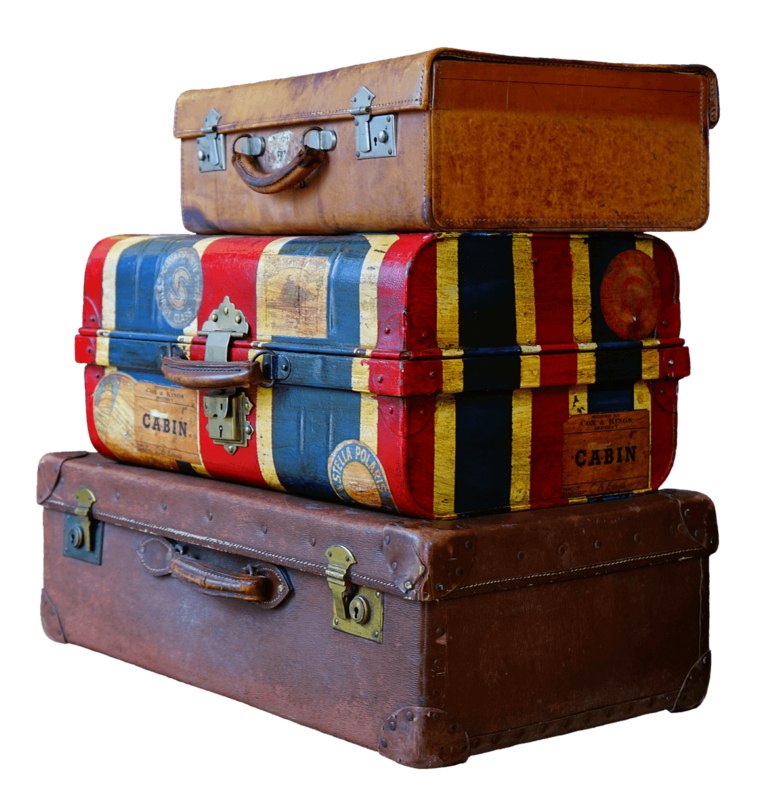 I hope these posts help you plan future trips with your kids. Today’s review is about Auckland’s aquarium. During a recent trip to the North Island of New Zealand, we visited Auckland’s aquarium (which is actually called Kelly Tarlton’s Sea Life Aquarium) for the first time. It ranked #1 on Boston’s list of favorites during the trip. While he believes you should devote a whole day to this aquarium, I think, realistically, a half day is the perfect amount of time to fully enjoy it. The penguins look at you! In Boston’s opinion, the best exhibit in the aquarium is the penguins. 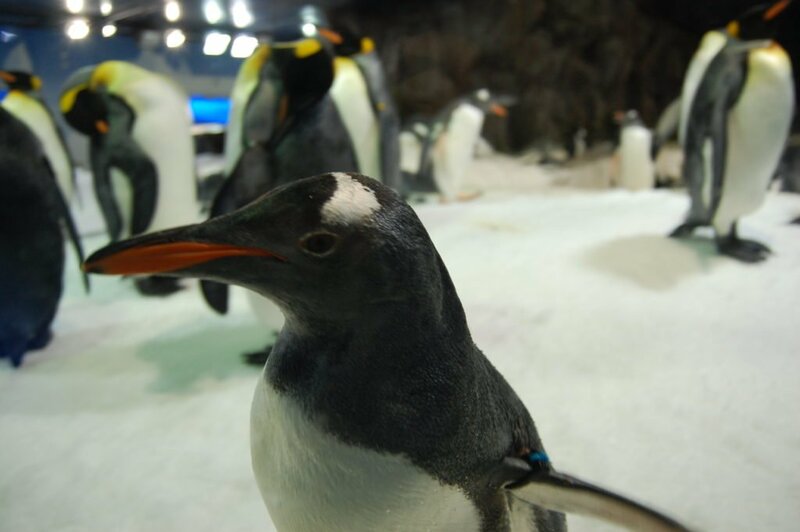 Kelly Tarlton’s has the largest exhibition of Antarctica penguins in the world. This is a great exhibit, according to Boston, because the penguins will look at you and they are funny. The exhibit is quite large and is one of the first ones you encounter when entering the aquarium. There are quite a few viewing windows, which allows you to see the penguins swimming and on land. Everyone can get up close with a sea turtle. Boston also enjoyed the sea turtles. 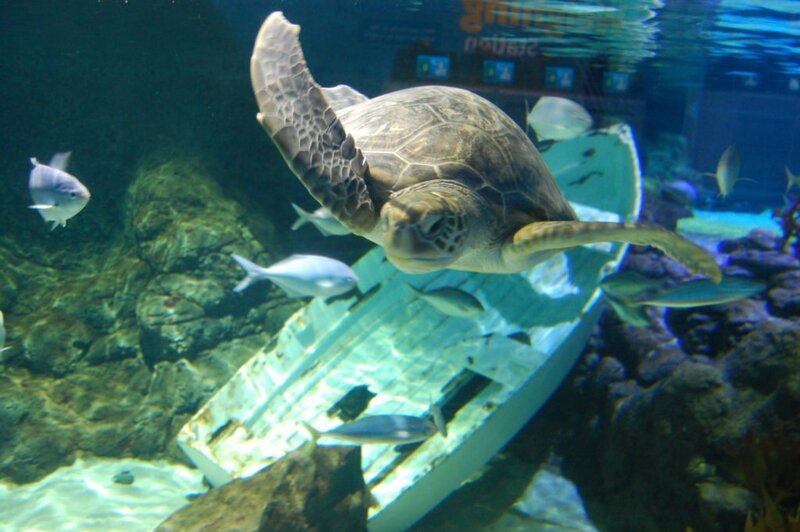 There is actually two parts to the sea turtles area of the aquarium: a tank with some fish and real sea turtles and the sea turtle rescue. The tank is great for kids because the glass goes all the way to the floor, making it easy for the little ones to see the turtles. It is a pretty large tank, too, so there is plenty of space for everyone to see the turtles at the same time. 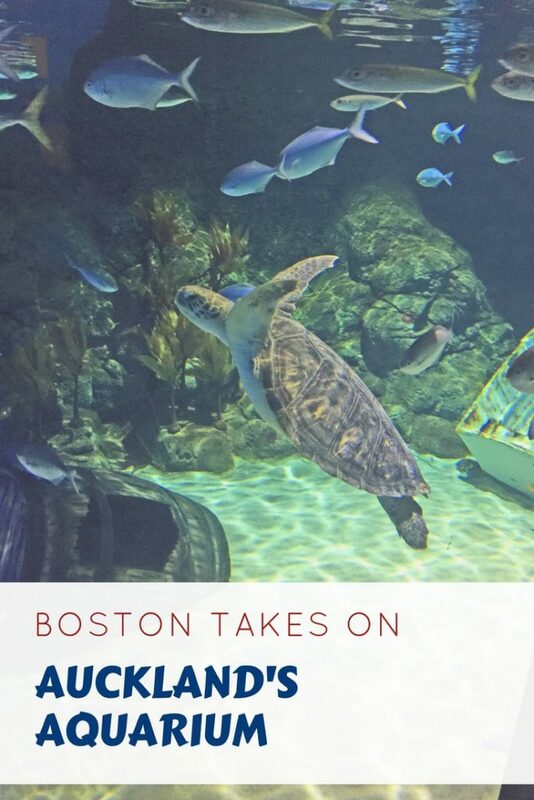 The sea turtle rescue was a highlight for Boston. It is an interactive display with 5-6 stations for kids to work their way through. To start, a child chooses a card with a particular breed of turtle on it. 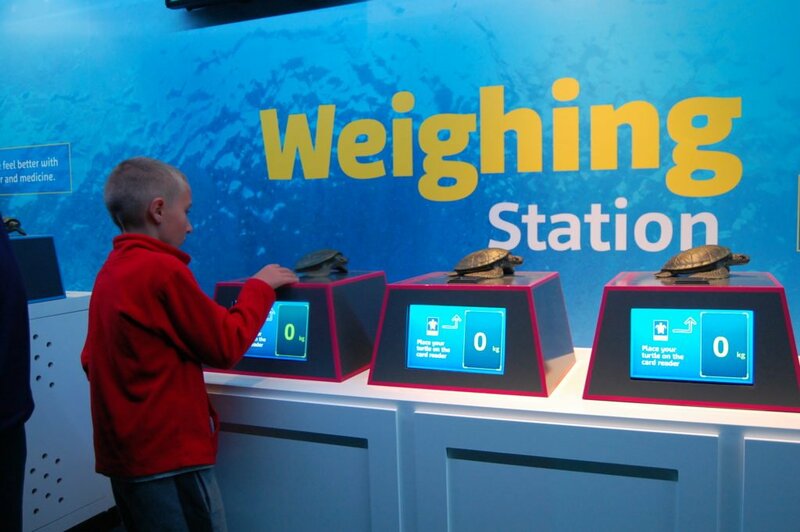 The first station tells you what’s wrong with the turtle you chose. At each remaining station, your child nurses the turtle back to health step by step, by giving it medication, feeding it, and other things. At the final station, your child releases the turtle back into the wild. One of the stations at the sea turtle rescue exhibit. The shark tank is cool no matter how old you are! It is a long oval with tunnels on the long sides and a conveyor belt. You stand on the conveyor belt and are slowly moved around the oval while lots of large sharks, fish, and giant manta rays swim all around you, including over your head. It gives you a unique view of these amazing creatures. Kelly Tarlton’s Sea Life Aquarium is located at 23 Tamaki Drive in Auckland. It is open from 9:30 am to 5:00 pm everyday of the year. Admission is $39 (New Zealand dollars) per adult and $22 (NZD) per child. They do have some discounts which can be found at the aquarium’s website. At the shark tank, the sharks swim all around you. Kelly Tarlton’s Sea Life Aquarium is an amazing way to spend half a day in Auckland. It is entertaining and educational for kids of all ages. The shark tank and penguin exhibit are well worth the price of admission. 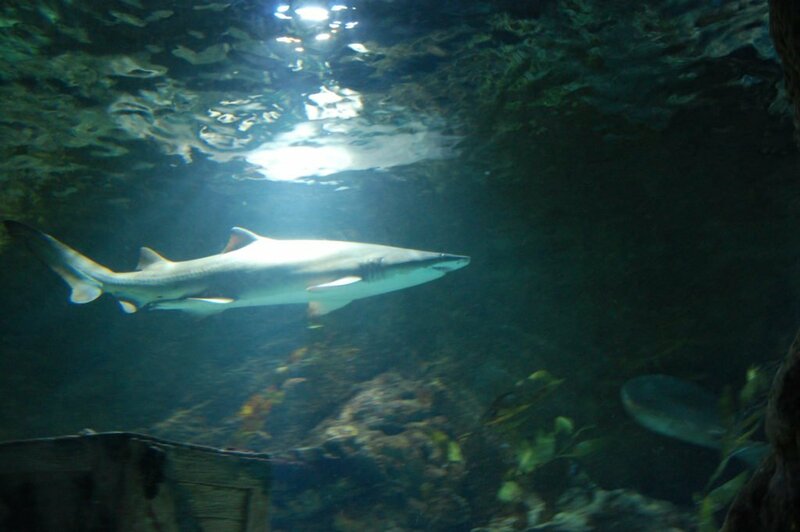 During your family’s next visit to Auckland, be sure to visit Auckland’s aquarium. Happy travels!